We provide servers in The United States Of America and Europe. Our Minecraft hosting is for high-performance servers that want zero lag, excellent fast response support and customizable options to change both the jar file used, the Java version and easily scalable when you reach the memory limits. Upgrade the memory of your server with ease. We also have mods in the mod manager consisting of DireWold, Feed The Beast CrackPack, Feed The Beast Infinity, Feed The Beast SkyFactory, Infinity Evolved Skyblock, Pixelmon, and more added all of the time. With our 24-hour support you will never be without the help you need to get your server exactly how you want. We also sponsor Minecraft Server List where you can add your server to get more players. You can install custom worlds with our mod manager. Will my Minecraft server be online 24 hours a day? Yes, your Minecraft server is always online. That is the main reason to pay for game server hosting. All power and network traffic are covered in your subscription so that your server can be online all of the time. Even when your PC is turned off, your clan or community friends can join your server and play in your absence 24 hours a day, 365 days per year. How are Minecraft updates handled? If a Minecraft server update is released all you need to do is click the Steam Update button on our control panel. The server will begin to check your files and update as necessary. Once you are logged in your server may still be 'Installing'. This simply means that your server is updating to the latest Minecraft version via a Steam update. After a minute or two, click refresh on your browser and your server will be shown as 'Running' and will be ready for you to configure your own server title and admin password. Why do i even need Minecraft hosting? Well, there are three ways you can host your own Minecraft server. You could rent a dedicated server and host a Minecraft server on it. This option has some great benefits and we do offer dedicated servers should you go for this option. With a dedicated server, you will get all of the resources focused on one or several servers so you can guarantee the best possible performance. You get root access to the machine so you can easily update the server and run it with a Windows batch file. However, on the downside, there is the initial setup of the Minecraft server which can take some time and expertise to get right, as well as updating it when an update comes out. You would also need to install MySQL and configure it. We do offer a TCAdmin2 licence addon which gives you access to our control panel to create servers for only £20 extra per month which will make things a lot easier but with this option enabled you will not get root access (to protect our scripts). The best solution is to rent a server from GTXGaming. Server rental will give you the best value for money. You get the control panel for free, and we host the server 24 hours a day, seven days a week. Rest assured that we do not over populate our machines and your server will run as smoothly as if you had a rented dedicated server. There are also added options of high CPU priority too so if your server is bustling with 100+ players you can add this to get things even smoother and with our 24-hour support you can be confident that you can get your Minecraft server up and running in no time. Get bored with Minecraft? You can Game Switch to any other game we host with our easy switching tool. Switch back anytime you want. We zip up your Minecraft server on every reboot and upload it to our offsite backup NAS. You will never lose data at GTX. We hold data from every reboot for 60 days. Our automation means your Minecraft server will be up instantly no matter what time of day it is. As soon as you order go to the client area, services and get your username and password. You can schedule any rcon command to be sent to your Minecraft server, for instance, save the world or send a message. This means you can send a message before a scheduled server update or reboot. 24 Hour no quibble refund. If you order an Minecraft server from us and are not entirely happy we will simply refund you. Minecraft is a three-dimensional sandbox game that allows players an unmatched level of freedom to decide how they want to play their game. While there are no specific goals for Minecraft players to accomplish, there is, however, an achievement system. By default, Minecraft gameplay is in the first person but in obeisance to its idea of flexibility, players can play the game in the third person. Essentially Minecraft is about breaking and placing blocks. Much like the real world, Minecraft would feature rough 3D objects set up in a fixed grid pattern. These objects symbolize a variety of materials such as dirt, ores, stone, water, tree trunks, lava etc. Perhaps the only notable restriction Minecraft has is with object placement as building objects can only be placed at a fixed location. In contrast, players can move around seamlessly. 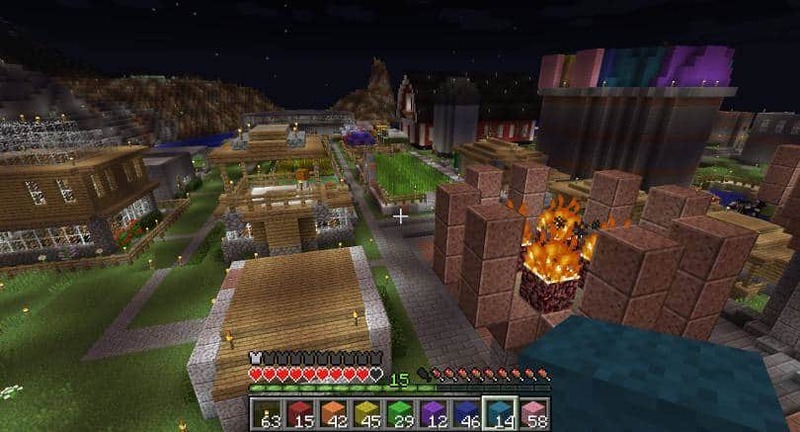 As players proceed during gameplay, the game world is generated at the time of world creation using a map seed which is obtained from the system clock, thus making the Minecraft game world, a procedurally generated world. Players are also able to tweak this feature manually. Minecraft players have no limits when moving horizontally but there is a limit in upward and downward movement. A seemingly infinite game world can be generated on the limitless horizontal plane at least until players encounter technical problems. This infinite game world creation is achieved because the Minecraft game world is split into small sections known as chunks. These chunks only get created when players are nearby to the point of creation. The Minecraft game is based on dynamism and limitless creativity and as such its physics is somewhat unrealistic. Certain objects do not obey the law of gravity, complex systems are constructed by making use of primitive objects etc. The object of Minecraft is very simple, Eat, Craft, Survive! You start off with only the clothes on your back. Your first objective is to punch down some trees for the wood needed to craft your first basic wooden tools. Your second objective is food. Early game, You can obtain apples from Oak trees, Meat from animals, And if you're lucky you will find a village with ample crops. (Don't forget to ask the villagers nicely if you can take some). Night time, Now this is a whole new kettle of fish. You want to avoid night time like the plague if you can help it. Stay inside and work on the interior of a base perhaps. Only go outside if you're willing to take an arrow to the bum from a skeleton or have your limbs blown off from a creeper! Once you have tools, Food, Armour and other items to help you along your way, You can start exploring the world, Go into caves for those elusive diamonds. Making sure you don't fall into Lava (Unless you like being turned into crackling and losing all your items.) And explore abandoned mine shafts. The Minecraft world is your oyster! Have fun and beware of the night! It's a scary place out there.